Recently someone asked me if I was talking to anyone about all of the losses that I’ve experienced in the past year. I told them that I was kind of processing on my own, but that I was planning on seeing someone once things got into a normal pattern around here with the kids back in school and all of that. But the truth is, I don’t really want to go to therapy. I don’t want to talk to a counselor, because I don’t want to have to say some of the ugly things that are inside of me out loud. I don’t want to talk about the things that led to the end of my first marriage. I don’t want to talk about the regrets I feel about my mom’s death and the year leading up to that. I don’t want to talk about how hard it is to look for a new church. I sure as hell don’t want to talk about how guilty I feel about Elliott’s death. I write about a lot of personal things here, but I hold a lot back as well. There are feelings and events that are just too intense to write about publicly, things that I need to work through with a trained professional. I know what a lot of them are, but rolling those thoughts around in my brain is far different than actually speaking them out loud. Today we lost an amazing actor to suicide. Robin Williams managed to blend humor and drama in a way that very few actors are able to achieve. His death is tragic not only because we are losing a gifted artist, but because he felt so alone that he was unable to go on. Someone who was loved by millions still felt worthless, still felt like he had nothing to offer. And rather than seeking help, he took his own life. This thought, asking for help, is frightening to me. Sharing ugliness on that level is scary. Being honest about failure is never easy, even if that failure is only in your mind. But honesty is where we find healing. Truth is where we find freedom. The truth is, you and I have value. Robin Williams was unable to recognize his value, and he took his life. His loved ones deserved better, and he certainly deserved better. It’s the same for us. It’s the same for me. I have value. I am loved. I am not alone. And tomorrow I’m going to call to set up an appointment with a therapist. 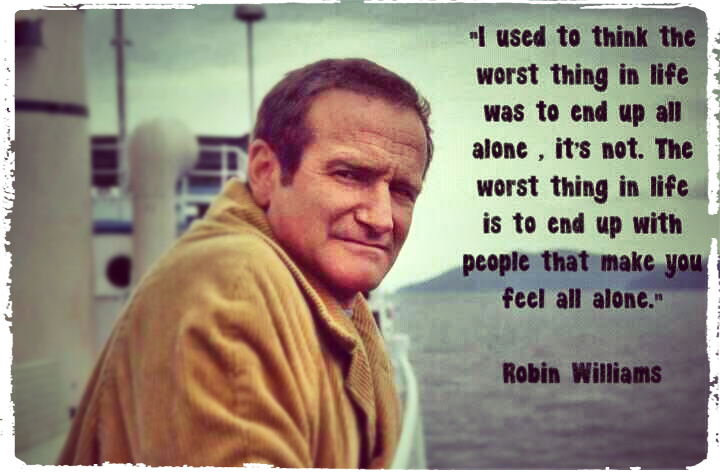 This entry was posted in Depression, Grief and tagged counseling, depression, Robin Williams, suicide, therapy. Bookmark the permalink. Good for you!!!!! You have been through a lot. I’m sure this outlet has helped but if there are things …….. big things that you are still trying to handle, get the help. I know you don’t know me but I want to tell you that I am proud of you for doing this. It is a good thing, for you, and your family. Thank you. Your kids need you. The world needs you. I am so glad and grateful to read this, Alise. Please select a therapist with care – interview two or three and go with the one you feel right with in your gut. It can change your life. But it ain’t easy. I’ve been talking to a therapist for twenty years, honey. So I know whereof, I speak, okay?